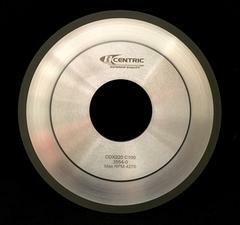 Grinding wheels are a must have in any woodworking grinding room. Depending on the material and application (roughing out material or putting on a finish) there are several different styles of grinding wheels you can choose from. What type of wheel do I use to grind High Speed Steel? What type of wheel do I use to grind Carbide Tip Knives? What type of wheel works best with Carbide? If you are grinding HSS, most operators will switch to a CBN wheel for finish grinding. The CBN lasts longer than an aluminum oxide wheel and when complex profiles require a very thin kerf, it’s much safer to grind with a CBN compared to aluminum oxide. We offer CBN wheels as thin as 1.25mm. If you are grinding carbide knives, most aluminum oxide wheels are not designed to cut materials as hard as carbide whereas CDX and Diamond are designed to give the best possible grind on carbide material. Just like other aluminum oxide or ceramic wheels, CBN, CDX and Diamond wheels are available in various grits (for rough or finish grinding). Wheel sizes will vary depending on the equipment used. Most common is 8” outer diameter & 60mm bore with 5mm hub offset on either side. Outer rim shape can also come in a square or radius end. Make sure your stylus or tracing pin matches your CBN, CDX, or Diamond wheel. We stock all kinds of hardened stylus pins for profile grinders. For example if you are grinding a crown profile into a carbide inlayed knife using a Rondamat profile grinder you could use a CDX 8” x 1.25mm x 60mm grinding wheel paired with a 1.25mm stylus pin.